OnePlus 5 will be launched this Summer but the expected dual-camera setup on the phone is increasingly becoming a mystery. Just recently, new renders of the smartphone were leaked online and suggested that the design of the vertical dual-camera setup at the back of the phone will be slightly different (oval-shaped) compared with earlier renders that suggested a round-edged rectangle shape. Now, two freshly leaked renders have put the orientation of the dual camera setup into question itself. Separately, the phone seems to have made its way to AnTuTu benchmark website as well. First talking about the renders, the new mockups, obtained by Pocket-lint and AndroidPure, show the dual-camera setup at the back of the smartphone in both vertical and horizontal orientations respectively. Interestingly, the renders with camera setup in vertical orientation seem to resemble the renders that first surfaced Internet. On the other hand, the renders with horizontal orientation seem to suggest that the smartphone will carry a similar design to predecessor OnePlus 3T. 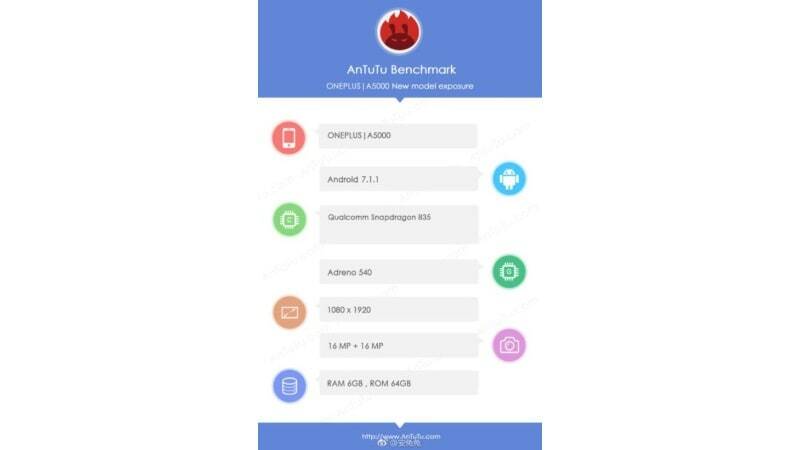 Moving on to the benchmark listing, a OnePlus device with model number 'A5000', assumed to be OnePlus 5, was spotted on AnTuTu benchmark website, as per AndroidPure. In the listing, the OnePlus 5 will run Android 7.1.1 Nougat out-of-the-box and will feature a full-HD (1080x1920 pixels) display and will be powered by a Snapdragon 835 SoC coupled with Adreno 540 GPU and 6GB of RAM. In terms of optics, the listing suggests that the phone will come with a 16-megapixel primary rear camera and a 16-megapixel camera at front for taking selfies. The listing suggests that the OnePlus 5 will come with 64GB built-in storage. Notably, earlier leaks have suggested that the OnePlus 5 will pack 8GB of RAM. This might indicate that the phone can possibly have two variants, with 6GB and 8GB of RAM. Interestingly, the smartphone was able to get a score of 176,000 on AnTuTu benchmark, and looks all set to give tough competition to other flagship devices.